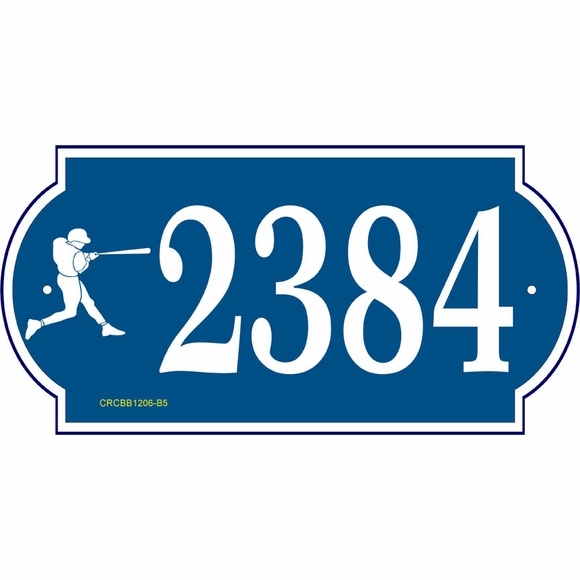 Personalized Address Sign with Baseball Symbol - - custom made baseball lover's address plaque that features a baseball symbol to the left of your address. Unique enhanced rectangle shape. Wall mount. Made in USA. One-line sign holds up to four (4) big 3.5" numbers. Customized with your choice of baseball symbol, color, and address numbers you specify. Select one of these symbols: fielder, baseball and bats, pitcher, catcher, or batter. Four (4) large 3.5" numbers (or name if desired) on one line. Border and symbol are the same color as the address and accentuate the enhanced rectangle shape. Baseball theme personalized address plaque crafted in the USA by skilled artisans to assure the highest quality.